We know how annoying and confusing it can be when flooring jargon is used when describing products, and so we’ve come up with the ultimate glossary for flooring terms. Hopefully this will act as a guide for when you really want to know your cupping from your crowning, and your bleached from your brushed. Abrasion Class (AC) Rating – The AC Rating System was introduced by the European Producers of Laminate Flooring in order to rate laminate flooring based on a series of tests. This process tests the laminate resistance to impact, stains, burns, and abrasions. The greater resistance shown by the laminate, the higher the awarded AC rating will be. For areas with a greater footfall, a flooring with a higher AC number should be selected. Acclimatisation – The process of allowing your wood flooring to adjust to the humidity in your home. Contraction or expansion of wood will vary depending on the amount of moisture in the air. Adhesion – The sticking of two materials together. The quality of the join will depend on the condition of the two surfaces. Alternative Flooring – Quirky British carpeting, runner and rug brand, that were awarded the privilege of being named the first exclusive company to be a CoolBrand. Amtico Flooring – A luxury British flooring brand, that offers a large selection of flooring ranges and products, including Amtico Spacia Flooring, Amtico Click Collection, and Amtico Signature Collection. Annual Growth Ring – The layer of wood growth formed on a tree during a single growing season. Antique – Flooring that appears to be worn and old due to treatment and design. Applicator – A tool for applying adhesive, oil, seal or other dressing. Architrave – Wooden frame for doorways. Usually requires undercutting to permit wood flooring to fit under it. Axminster Imagination Rugs – Rug division of British carpet makers, Axminster. Their Imagination Rugs are constructed of 100% wool and offer vibrant, playful designs for children. Balterio – Belgian flooring company who offer click express installation for their laminate flooring. Bevelled Edge – The practice of the edge of planks being planed to create a V-shape groove between boards when they are laid together. Bleached – A flooring product that has been lightened by staining or applying wood bleach. Bona – Swedish floor mops and accessories brand. Border – A feature in a floor, whereby a contrasting timber is inset around the perimeter – often called an ‘inset strip’. Bowed – Form of distortion that can occur within mistreated wood that results in a curved, rather than flat face. Brink and Campman – Dutch rug-makers, offering special order products in vibrant colour schemes and nature-inspired patterns. Brushed – Timber is heavily brushed with thick copper wires to create a textured surface during manufacture. Calvin Klein Rugs – The luxury clothing brand’s rug range offers a collection of some of the finest rugs in the business. Carpet Tile – Flooring often used for commercial environments, its individual tiles make replacing worn areas effortless. Case Hardened – This occurs to timber that has been improperly dried. When wood dries too quickly, it shrinks heavily on the surface compressing its still damp interior. This can result in unrelieved case-hardened wood which may warp considerably and potentially dangerously when the stress is relieved by sawing. Chêne – Laminate flooring and engineered wood flooring company. Click Joint – Method of joining the boards of laminate floors together without using glue. The two fit together when a tongued piece clicks into place into another piece which has a corresponding groove. Clout Nail – Short, thick nail that has a large, flat head. It is often used when fixing solid floor boards as a decorative feature. Colour Variation – Natural colour change that is seen in engineered wood and solid wood flooring. Construction – What a product is made from. Crowning – The end of an individual strip is curved, with the centre of the strips higher than the edges. The opposite of Cupping. Cupping – The opposite of Crowning. A concave appearance of individual strips with the edges raised above the centre. Damp Proof Membrane (DPM) – Polythene sheet which is installed under floors to act as a barrier against moisture and rising damp. Delaminating – Separation between layers in an engineered or laminate floor. This is usually caused by the failure of adhesives between piles, while it can also occur between the layers of stain or coating. Dimensional Stability – The ability of wood to retain its original size when it comes into contact with exterior elements such as water. Engineered wood flooring is less susceptible to fluctuation than solid wood. Distinctive Flooring – British flooring experts, producing the finest vinyl tiles, carpet tiles, and easy-fit flooring systems. Distressed – The process that artificially gives flooring a worn and lived-in look. This can be performed in a number of ways, such as creating superficial surface damage which can then be finished with an oil to soften the blemishes. Durability – A product that offers a long life-span and resilience against external conditions. Elka – British Flooring brand which offers Solid, Laminate and Engineered Wood flooring options. End Joint – The end section of a piece of flooring that will be joined to the next plank. End Profile – Molding used to provide a subtle finish to ends or corners. Engineered Wood – A construction type of hardwood. These floorboards are constructed from multiple layers of solid wood, to create a cross-ply construction. The top layer of these boards is the name of the product installed, such as beech or walnut. European – Products that are sourced in Europe. Expansion Gap – A gap that is left on the perimeter of a wood floor, which allows for further growth and additions to be made to a floor. Fading – The draining of a product’s colour after being subjected to wear and tear, and elements such as heat and light. Feature Strip – Used with luxury vinyl tiles, separating each plank. Figure – The appearance of wood, including grain and cut. Some tropical woods have instantly characteristic figures, such as stripes, curls and jagged lines. Filler – A substance which is used to fill holes, gaps or irregularities within a sanded surface. This is often applied before a finish will be employed. Finish – Protective layer applied to wooden floors. Floating Floor – Floor is connected by mechanical or adhesive connectors, and so doesn’t need to be nailed or glued to the subfloor. Forbo – A British flooring company that produce the Tessera Carpet Tile range. Furniture Gliders – Small, disk-like pieces that aide moving furniture on non-abrasive surfaces. Gloss – A shiny, light reflecting finish. Glue Down Installation – When a floor is fully stuck to the sub-floor with an adhesive. Grade – Defines the quality level of timber. Gradus – British Flooring brand, specialising in carpet tiles. Grain – Fibrous lines in the wood that created the pattern that can be seen on the floor. Grouting Strip – Strips that sit between luxury vinyl tiles. Hand Scraped – Process that adds visual character to flooring by creating an uneven surface. Hardwood – Timber from the botanical group of deciduous trees that have broad leaves. Header Joint – The joint at the thin end of two boards that joins them together (often referred to as the end joint). Heart – The core of a tree, where growth rings can be seen. Heuga – European carpet tile company that focus on sustainability and reducing waste. High Density Floorboard (HDF) – A type of fibreboard, an engineered wood product. Made from highly compressed exploded wood fibres. Humidity – The amount of water vapor in the atmosphere. Inlay – An embedded feature of contrasting wood manufactured into a floor. Insulation – Layer of material that improves the warmth of a room, one is often built into the subfloor as a barrier for sound or heat. Interface – American company, who are the world’s largest manufacturer of modular carpet. Jacaranda Rugs – British Carpet and Rug company that offers a fine range of designer products. Joint – The point at which two parts of a structure are joined. Joist – One of a collection of beams that supports a ceiling or floor load, supported by larger beams, bearing walls and girders. Kährs – Pioneering Swedish engineered wooden flooring company. Karndean – British luxury vinyl flooring company. Kilim – A flat-woven carpet or rug made in Turkey and neighbouring areas. Kiln – A controlled temperature oven or furnace that’s used for drying veneer, lumber and other wood products. Knots – The dark marking or hard place on a tree where a stem or branch has grown from. Kronoswiss – Industry-leading Swiss laminate flooring company. Kronotex – German laminate flooring giants. Lacquer – A resin that is used as a varnish; giving a floor a smooth, glossy, resistant finish. Laminate Flooring – Hardwearing floor constructed with a fibreboard core and Melamine wear layer that is available in wood, ceramic and stone effects. Life Flooring – An engineered wood company. Load Bearing – A part of a structure that supports much of the weight of a building. Louis de Poortere – Bespoke Belgian rug making company. Luxury Vinyl Tile – Versatile vinyl floor tile that is protected by a sturdy urethane wear layer and is easy to fit. Maintenance – How to look after and care for your floor. Matt – A non-shiny finish. Medium Density Fibreboard (MDF) – Wood is broken down into wood fibres and then combined with wax and resin. Often used to manufacture engineered flooring. Moduleo – Luxury UK vinyl flooring company. Moisture content – Relative level of moisture contained within a piece of wood, this is often expressed as a percentage of the total weight of the boards. Mosaic Tile – Ceramic tile that has been mounted on a backing for an easy installation. Movement – The swelling or shrinkage when wood is exposed to a variety of humidity conditions. National Carpets – Leading British carpet tile company. Nosing – Hardwood molding that is often used to cover the outside corner of a step. It is commonly used on landings. Oiled Finish – Oil wax coating, retaining the natural character of wood, while also increasing durability. Oriental Weavers – Egyptian luxury rug manufacturers – renowned for being one of the largest machine-made rug manufacturers in the world. Osmo Accessories – German producer and provider of modern wood products. Parquet Flooring – Flooring formed with battens. In the past this would have been face pinned and glued to wood subfloor, while these days they are laid over solid subfloors. Its calling card is a patterned floor, often herringbone, and normally laid with a border. Plank – Board widths that are 3 inches in width or greater. Plantation Rug Company – Rug company famed for its vibrant products. Plywood – A type of strong, thin wooden board that consists of two or more layers glued and pressed together, with the grain alternating. It is used as an underlayment for vinyl flooring. Polyflor – British based leading manufacturer of luxury vinyl tiles. Polyurethane – A finish used on hardwood to protect it from damage. A polyurethane finish does not require waxing. Prefinished – Wooden floors that have been oiled or stained. Prime Grade – A clean grade of wood that contains no knots or sapwood. Quadrant – A curve shaped piece of timber used in flooring installations to cover the allowed expansion gap. Quarter Sawn – Wood that has a grain running parallel to the length of the board. Oak that is sawn in this method has ray like markings that flow diagonally across it. 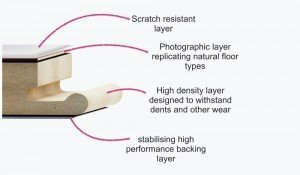 Quick-Step Flooring – Belgian flooring company that pioneered the first glue-free installation method. They offer ranges of laminate, luxury vinyl tiles and engineered wood products. Ramp Profile – Creates a transition between two floors of different heights. It is often used to bridge the gap between wood and carpet. Reclaimed Wood – Wood that has been recovered from an old structure or building, treated, and then used for another project. Residual Dampness – Moisture still present in a screed despite a surface’s dry appearance. Rippled – A rare effect that is found in maple and sycamore, it looks like a ripple across the width of a plank. Rising Damp – Often occurs in floors that do not have an effective damp proof membrane. The slow upward movement of water through absorbent building materials such as bricks and mortar. Rustic – Aesthetically rough and organic wood, it often contains knots, sapwood and variations of colours. Sap – A tree’s fluid that consists largely of water with dissolved sugars and mineral salts. Sanders & Fink – Timber and engineered wood flooring specialists that also offer luxury vinyl tiles. Scotia – A half rounded shape of wood used to bridge gaps between internal corners – perfect for covering expansion gaps around the edge of wood flooring. Screed – A levelled layer of a latex levelling compound that provides a clean, level subfloor for installation. Secret Nailing – A method of installation, which involves nailing through the tongue into a wooden sub floor. This nail will not be visible. Sensa – Dutch laminate flooring company. Shrinkage – When wood dries the moisture evaporates, causing the wood to shrink. Skirting – Wooden board that is fixed to the bottom of walls. Softwoods – Timber produced from needle or cone-bearing trees, such as conifers. Solid – Manufactured from a solid piece of wood. Species – Variety of tree which a flooring is made from, e.g. oak, beech or walnut. Strip flooring – Engineered or solid wooden boards, that are no larger than 3 inches wide, installed in parallel rows. Square Edge – Floors that have a smooth surface where all edges meet perfectly, blending from one plank to another. Subfloor – The bottom layer that a finished floor and flooring materials are laid on to. Ted Todd – Luxury wood flooring company, bringing a splash of Scandinavia to a home. Texture – The surface look and feel of a floor. Threshold – A strip of wood that forms the bottom of a doorway at the entrance of a room or home. TLC – Luxury vinyl flooring company. Tongue & Groove – Fitting method between planks. The tongue and grove effortlessly click together on adjacent boards. Trim – Finishing material that is used to cover gaps around the edges of a wood floor. Underlay – Layer of cushioning that is laid beneath flooring to provide support and protection. Under Floor Heating – A heating system that is installed under flooring. This will either be an electric or water based system. Unfinished – A product that requires treatment or staining after installation. Urethane – Protective finish that preserves the freshness of a product with polishing or buffing. UV Finish – An ultra violet coating that provides a product with protection from natural light. Vapour Barrier – A material that protects against water, and has a high resistance to vapour, e.g. plastic film or specially coated paper. V Groove – Groove that runs around the plank edge to make each plank stand out individually. It is often known as a bevel and 95% of wood flooring products have a V Groove. Veneer – A thin decorative covering of fine wood that is applied to the surface of an engineered wood flooring. Vinyl – Synthetic flooring material that requires minimum maintenance. Warping – The distortion of a piece of flooring after the effects of heat or damp. Wax – A product that is applied to a floor surface that protects the wood from wear and tear. Used to create a period style floor that is shiny and warm. Wear Layer – A layer of wood that is closest to the surface. Whitewashed – A product is sanded down, stained and then sealed in a white colour – a Scandinavian tradition to improve the light in houses during the long dark winters. Wide Plank – A plank that is wider than general products. Width – The measurement of an individual product from one side to the other. Wire Brushing – Technique that adds grain texture to wood. Wood Species – The principal tree that is used to make a floor product. Wood Stain – A paint designed to bring a decorative boost of colour to wood. When applied, the wood is deeply stained with that tone as the pigments penetrate the surface of the product.